The piano starts to play as everyone grabs another cookie and finds their seat. The crowd of older adults gathered at the Hartland Public Library are wearing Santa hats and Christmas sweaters, laughing and talking as they wait for the Christmas carol sing-along to start. This might look like an ordinary library program, but it isn’t. Everyone here are attendees of the Library Memory Project, a multi-library partnership to provide resources, support, and social opportunities to those living with Alzheimer’s disease and memory loss, as well as their care partners. The Library Memory Project was founded in 2015 as a collaboration between four public libraries in Waukesha County, called the Lake Country Memory Project. In 2016, four more libraries from Waukesha and Milwaukee counties partnered to form the Four Points Memory Project. 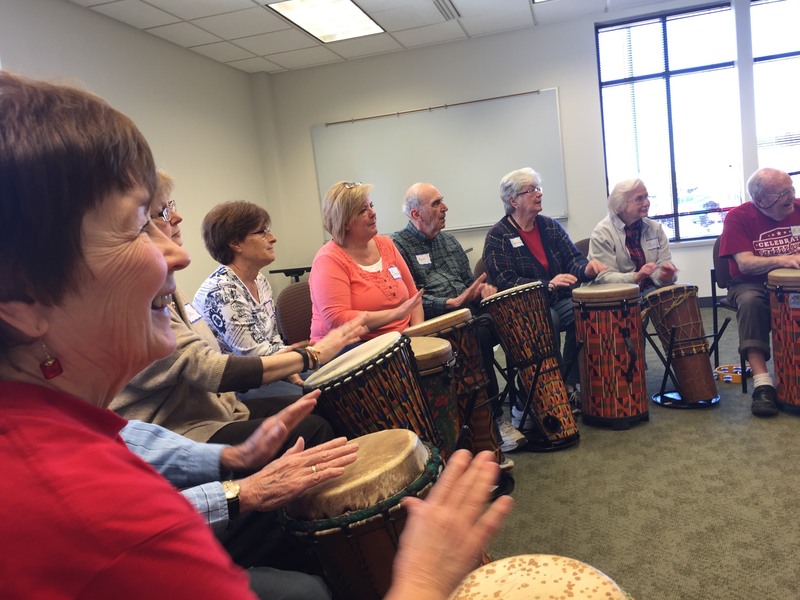 Within each Project, the libraries take turns in hosting monthly Memory Cafes, offering attendees a fun, social opportunity that is both safe and welcoming. Professionals from the local Aging & Disability Resource Centers, as well as the Alzheimer’s Association of Southeastern Wisconsin, also attend each café to connect with attendees and offer resources. The number of individuals with dementia in Wisconsin is expected to increase by 68% in the next 20 years, so the need for services like these will only continue to rise. Growth is already in the future for the Library Memory Project. Four libraries in Waukesha and Washington counties have formed the Wild Plum Memory Project, which officially starts next month. Everyone is invited to attend the Kick-off Event on January 15, 2018 from 3:00-4:30 p.m at the Menomonee Falls Public Library. Talks are also in place to expand into Jefferson County, while Irvin L. Young Memorial Library in Whitewater and L.D. Fargo Public Library in Lake Mills currently host their own Memory cafes. The Library Memory Project is many things to those who attend and to the library staff who run it. It is people sharing their favorite Christmas carol, making music in a drumming circle, planting flowers, and creating art projects. It is support and friendship, connection and community. And it is an inspiring example of public libraries seeing a need in their communities and finding a solution. You can find more information about the Library Memory Project at www.librarymemoryproject.org or by visiting its Facebook page.